Point, throw and form words! Fun game to feed the monster with letters. The discs are letters that, once inside the mouth, slide through a channel and are placed in an orderly fashion to form the desired words. 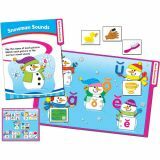 Active game for learning to read and write. Various game modes. Includes storage bag for playing pieces. 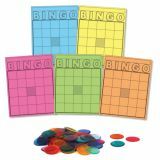 Includes 50 assorted color bingo cards plus 1,000 plastic, 7⁄8" chips/counters. 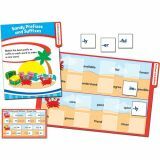 Perfect for use in centers or for individual practice, these fun and engaging file folder games are aligned with Core State Standards for curriculum reinforcement. 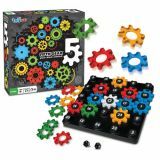 Features include 16 full color game boards with coordinating game pieces and a 24 page resource guide. 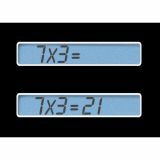 This kit is designed for a wide range of students. Younger children will be engaged by matching the objects to the bold silhouettes on the sturdy canvas mat. 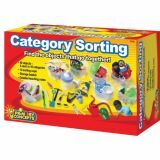 Older students can sort, classify, and graph the objects. 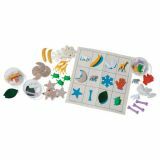 They can also trace around them, turning this versatile language and visual perception kit into a wonderful fine-motor activity. 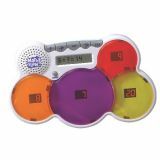 Kit contains 60 objects, 12 sturdy cups, washable canvas mat, storage containers, organizing basket, and Teaching Notes. 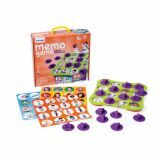 This great individual or group game helps children develop memory, concentration and visual discrimination. Plastic lids are specially designed for correctly performing the pincer grip. 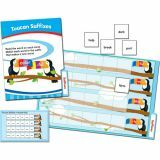 Includes 13" x 13" game board and 12 plastic activity cards. Gender equality, tolerance, respect, and good behavior.